If you had a terrible nightmare, would you see it as warning and try to change your ways? This was the question that faced William Rufus, the King of England. At least that is the story told by Benoît de Sainte-Maure. He was a poet hired by King Henry II of England to write Chronique des ducs de Normandie, an account of Henry’s ancestors. He left behind a vivid chronicle, over 44,000 lines long, that tells the stories of rulers such as William the Conqueror and his sons. No one loved spending as much as he did, no one was more energetic and enterprising; he was the least timid of men, the least faint-hearted. His mind was, however, set on doing things that earned him universal criticism, and that no consecrated or anointed king ever needed or was ever required to do. This view was actually quite common among contemporary chroniclers. The Anglo-Saxon Chronicle, for example, states that William was “hated by almost all his people and abhorrent to God.” Benoît’s main problem with William Rufus was his treatment of the Church, and in particular his dispute with Anselm, Archbishop of Canterbury. William had forced the Archbishop to leave England and go into exile. Our story begins in early August of the year 1100, when William Rufus was staying in the city of Winchester. Gundulf, the Bishop of Rochester comes to the king and tries to persuade him to reconcile with Anselm. The English ruler, however, dismisses the plea and decides that the next day he will go hunting in the New Forest. He dreamt he entered a huge, splendid and beautiful church; even though he felt like praying, his mind kept turning to other things. He was seized with an unbelievable hunger, and so violent and all-consuming was it that he felt as if he was growing weak and about to faint, almost to the point where he would eat his own hands. And this he would have done, had there been no alternative. His gaze then fell on the altar where he saw – or so he thought – a huge stag that had been killed. In order to avoid the great act of apostasy he was about to commit on himself, he approached the animal with the intention of eating some of it, since his one and only desire was for food. At that very moment he was stretching out his hand, he suddenly realised – and it seemed to him to be absolutely certain – that it was in fact a man’s body still bleeding from the wound that had killed him. He was seized with fear and revulsion at such a hideous sight. But so great was hunger, and so strong was his craving for food, that he was unable, despite every effort he could make, to prevent himself from being forced to eat some of it. He makes as if to pull off the man’s hand, but the whole of the arm comes away from the body. This he immediately devours, and then, not being satisfied, wants to seize hold of the second hand also, since his hunger had not diminished in the least. Fearful and terror stricken, he pulls it towards him, still attached to the arm, and eats it, but still his appetite is not satisfied. His hunger grew and grew but could not be sated. Biting savagely into the bone and flesh, he eats one of the feet, then the whole of the leg right up to the body. At this he feels twice as hungry as before, so without the slightest hesitation he immediately sets about devouring the second leg as well. This, however, is to no avail, for it has little or no effect on his hunger. At this moment, the man’s face comes into view, and this also he feels an urge to eat. But the spectacle he beholds is a death-inducing one: an absolutely terrifying pair of eyes, so horrible and hideous and so excruciating to look at that all the remains is for him to die, and for his heart to cease beating in his breast. Each and every one of them ribbed him, saying that they were scared he was turning into a saint, and they prayed God that he not include them in his prayers since they had so little trust in him. Everyone round him was convinced that he was joking, so they all began to put pressure on him. Each one of them speaks up, urging him to find some energy, be quick, and do what he really wants to do. So insistent are they that he ends up getting dressed and equipped and setting out with them straight to the forest. When the quarry comes within range and the aim is the best possible, one particular knight is very quick off the mark and ready to shoot, and so the king instructs him to do so. The man, however, becomes apprehensive and takes fright because the king is standing very close to his line of fire. On at least two occasions, I think, he decides, with bow ready stretched, not to shoot. But King Rufus urges him to go ahead, so much so that he impulsively lets loose a barbed arrow which, with the Devil’s connivance, strikes and glances off a sturdy branch, hitting the king close to his heart. And with that King William immediately dies. The knight who shot him flees, while the other companions cry out and lament their fallen ruler. Within a few days he is buried in Winchester, and his brother Henry takes the throne of England. 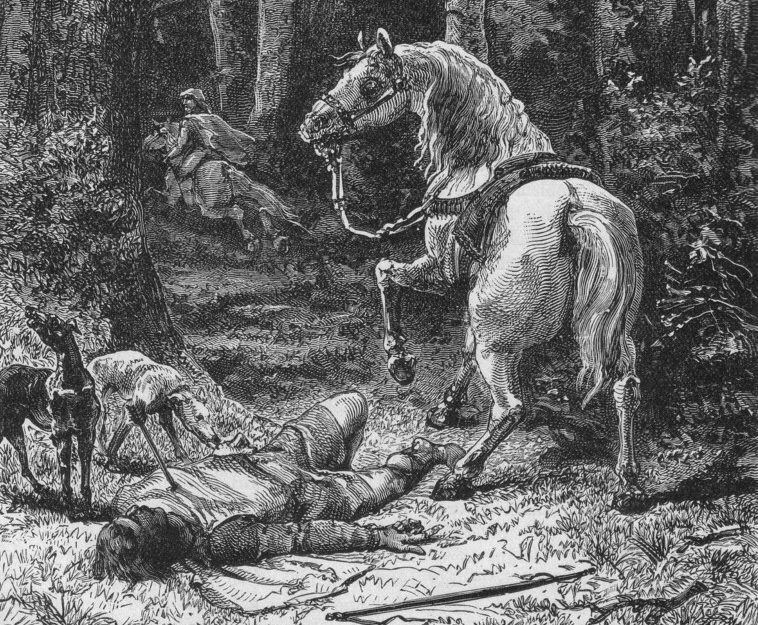 This is not the only version of William’s death, as other chroniclers have added other details – for example, the knight who shot William was a nobleman named Walter Tirel. Some historians have speculated that the King’s death was not an accident, but rather an assassination, carried out under the orders of Henry, who was also in the hunting party. In the end all of we can really say is that King William Rufus died in a very unusual way and Benoît de Sainte-Maure provides a good tale of how one should repent and avoid sin, as you never know when fortune will strike you down. Benoît de Sainte-Maure’s work, Chronique des ducs de Normandie, has been partially translated by Ian Short in Three Anglo-Norman Kings: The Lives of William the Conqueror and Sons. It has just been published by the Pontifical Institute of Mediaeval Studies – click here to learn more about the book. You can also buy it on Amazon.com.